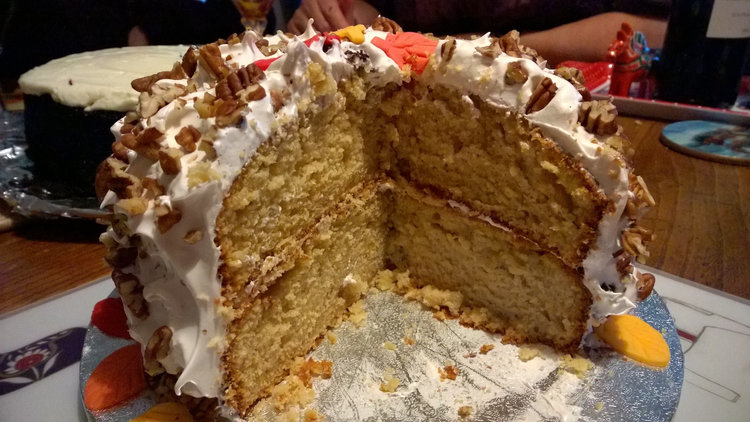 With a total of 475ml of maple syrup here, this cake is all about the maple! 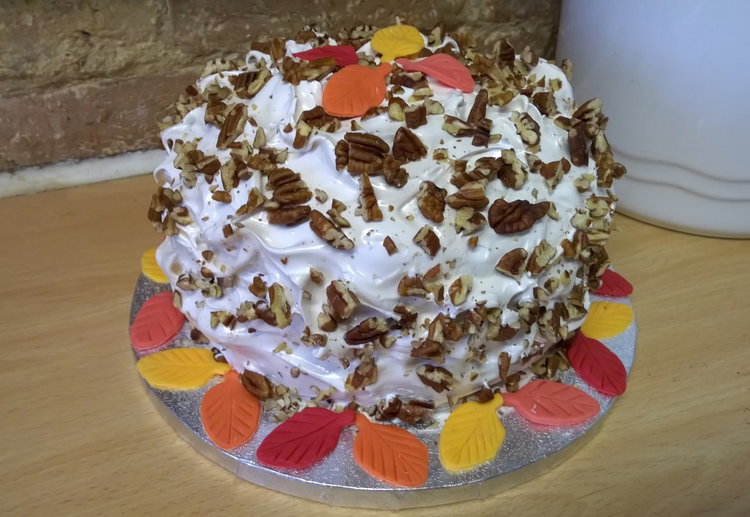 I made it for a birthday at the weekend, but it would be equally good for any kind of celebratory event in autumn – maybe a nice addition to a Thanksgiving party for those of you over the pond? 1. Preheat the oven to 180ºC/gas mark 4/350ºF. 2. 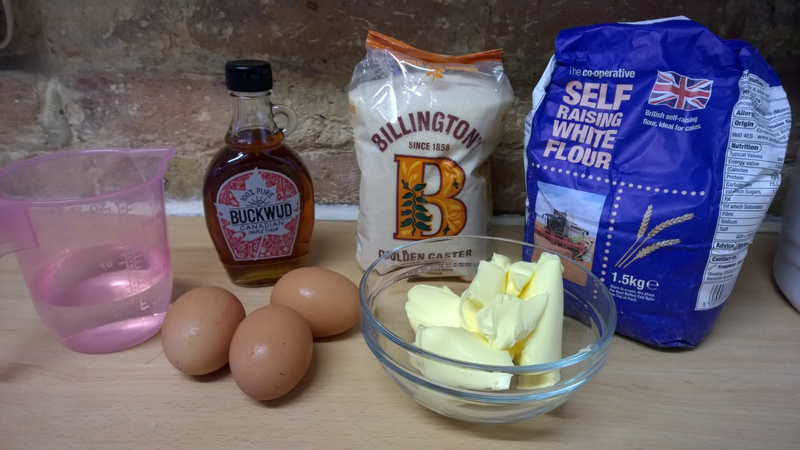 Beat together the butter and sugar until very pale and fluffy. Add the eggs one at a time, beating in well after each addition, then gradually add the maple syrup to make a smooth mixture. Finally, spoon in the flour alternately with the hot water, beating gently until smooth again. 3. Divide the batter between the two tins, and cook for 40 minutes. A cake-tester, inserted, should come out clean when they’re cooked. Let the cakes cool in their tins on a rack for 10 minutes before unmoulding them, then leave them to get cold before you get on with the icing. 4. Put everything except the pecans and vanilla extract into a glass or metal bowl that fits over a pan to form a double boiler. Fill the pan with enough water to come just below – but not touching – the bowl when it sits on top. Bring the water to the boil, set the bowl on top and, using an electric hand-held whisk, beat the mixture vigorously for 5-7 minutes. It should stand up in peaks like a meringue mixture. Take the bowl off the pan, away from the heat, and add the extract, beating for another minute. 5. Using the meringue icing, ice the middle, sides and top of the cake. Give the icing a swirly effect rather than smooth, letting the top have small peaks. 6. Roughly chop the pecans to end up with a mixture of fine and larger pieces. 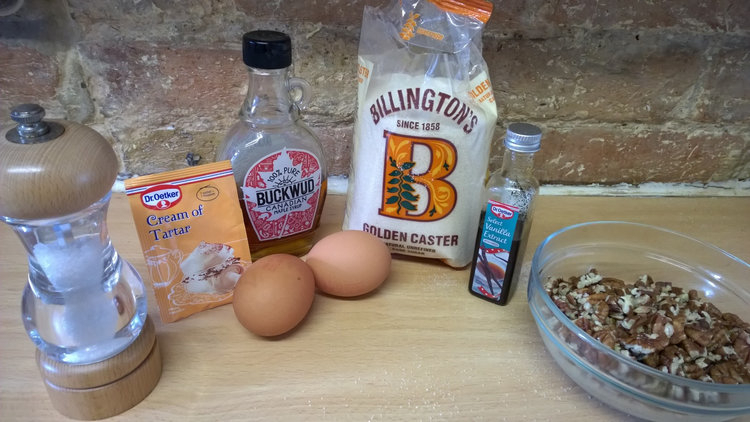 Sprinkle over the top of the cake, and throw at the sides. 7. 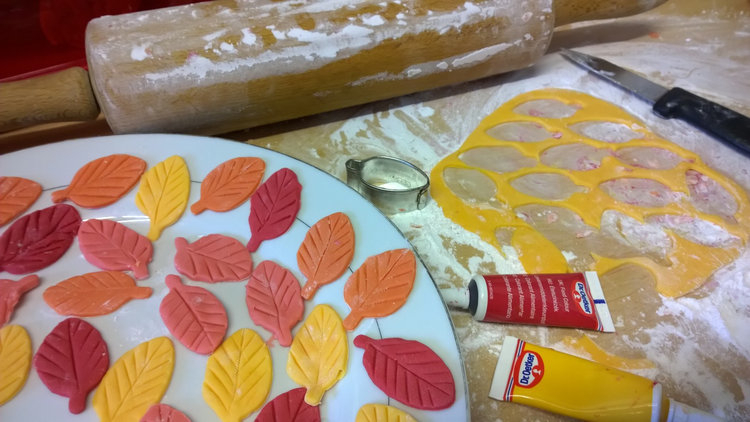 To make the leaves, knead the icing until it’s pliable, pull off pieces of it and mix in differing amounts of red and yellow colouring until you achieve the colours you would like (if you have green, use a bit of that too to get more earthy tones). 8. Roll the icing out thinly on a surface dusted with icing sugar. Use a leaf press (or knife) to cut out leaf shapes and then mark the veins on them with a sharp knife. Place the leaves on top and around the cake to decorate. This cake is best eaten the day it’s cooked. I thought the leaves would add a bit of a fun element to it 🙂 the person whose birthday it was likes little touches like that. Packing to be there shortly. Yummy. I am very impressed with the leaf adornment. See you soon! I probably should have made maple leaves shouldn’t I, but I didn’t have that shaped cutter! I bet your house smells absolutely wonderful! The smell of maple is rather delicious isn’t it!